Simple crafts and play for kids! By Melissa Lennig on October 10, 2012 53 Comments. This content contains affiliate links. As an Amazon Associate I earn from qualifying purchases. 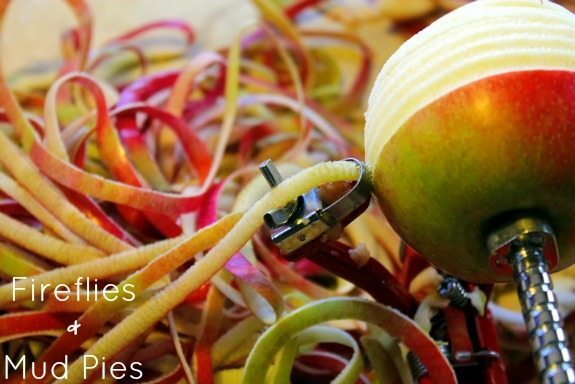 Have you ever peeled apples for a recipe or your child’s snack and felt guilty about wasting the scraps? No? Then you’re normal! I, on the other hand, was born with quite the guilt complex. When I was little, I used to feel bad for the toys I wasn’t playing with and would quickly run over to them to apologize for leaving them out of the fun (this was probably due, in part, to this 1986 Christmas movie by Jim Henson that led me to believe my toys were alive). This post contains affiliate links. Opinions are my own. 1. Peel the apples. Prepare your canner, lids, and jars. 2. Cook the peels and cores in 6 cups of water until soft (30-45 minutes). 3. Place cheesecloth inside of a strainer. Pour the apple parts and water into the cheesecloth and allow them to drain. 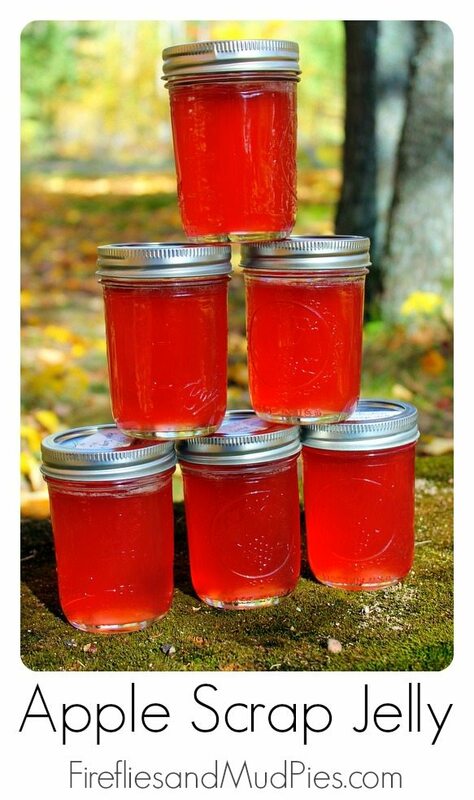 Don’t squeeze out the excess liquid or your jelly will be cloudy! 4. Add water to the liquid, as needed, to obtain a total of 7 cups. Put the 7 cups of liquid back into your clean pot. Add classic pectin and bring to a rapid boil. 5. Add sugar, stir, and boil hard for 1 minute. You’ll know it’s ready when the jelly starts to bubble up the pot. Remove the pot from the heat. 6. Ladle the hot jelly into hot, sterilized jars, remove bubbles and check head space (1/4 inch), tighten lids to finger-tip tight, and process for 5 minutes in a water-bath. After 5 minutes, turn off the burner and remove the lid. Allow the hot jelly to rest for 5 minutes in the water. Remove the jars, allow them to cool, then check that they sealed properly. Label, store, or giveaway! Apple scrap jelly is beautiful, and tasty too! I didn’t add any food coloring – the cheery pink tone is from the apple peels. We’ve enjoyed this jelly on peanut butter sandwiches and toast. Of course, I give plenty away to neighbors, friends, family, and teachers. 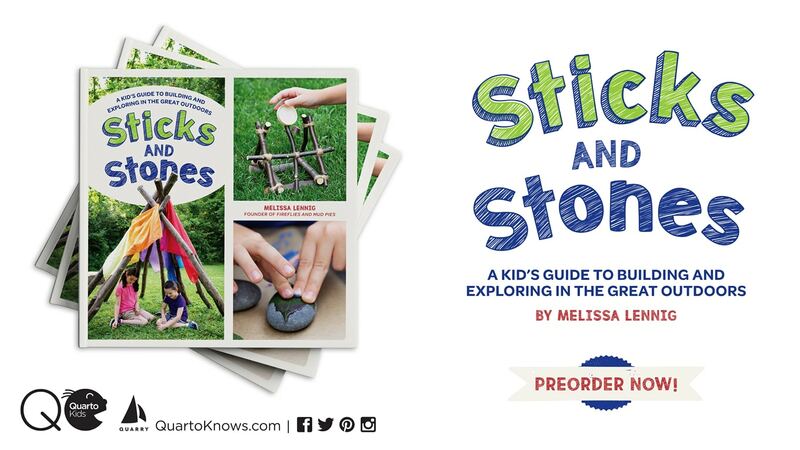 Melissa is a mom of two boys and a former Elementary School Counselor. 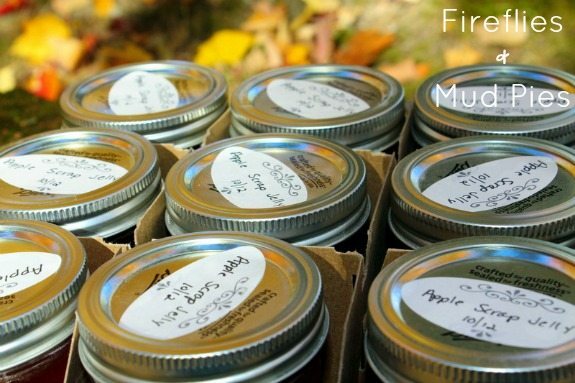 She shares easy crafts, activities, recipes, and parenting tips on her blog, Fireflies and Mud Pies. Follow her on Facebook, Pinterest, and Instagram. This is a great idea. We’ve used similar recipes for many years, but we throw in a package of plain Kool-aid too. Any flavor will do, but strawberry is a sure pleaser. What a sweet comment! So glad you found us, Georgia!